The managers of the Miami Herald acted harshly, rashly and timidly when they decided to fire columnist Jim DeFede in the emotional aftermath of a shocking suicide in the newspaper’s lobby. There was enough tragedy for one day when Arthur E. Teele Jr., who was described by the Washington Post as “a spectacularly skilled and spectacularly flawed Florida political legend,” shot himself to death Wednesday in front of a potted palm the Herald’s marble lobby on Biscayne Bay. An explicit, four-column photo of scene was (appropriately) the centerpiece of the newspaper’s front page the next morning. Five hours after the mortally wounded politician was rushed to the hospital, Mr. DeFede, a long-vigorous voice at the Herald, was fired at about 11 p.m. for admitting he had taped without consent one of two desperate final telephone conversations he had with Mr. Teele. It is illegal in most cases in Florida to tape a call without the permission of the other party. According to an interview with Mr. DeFede reported by the Washington Post, the journalist says he discussed the incident with management after “being assured by one of the paper's lawyers, Robert Beatty, and by publisher Jesus Diaz that he had attorney-client privilege.” The Post quoted Mr. DeFede as saying the attorney promised, "The Herald will support you." Later that night, Mr. DeFede was on the street. The abrupt cashiering of the columnist has sparked a firestorm of protest and second-guessing, including an instantly posted blog where hundreds of journalists have added their names to a petition urging the Herald to reinstate Mr. DeFede. I am adding my name to the list, because, first and foremost, there is reasonable doubt about whether Mr. DeFede actually broke the law. I also think the punishment didn’t fit the crime, if indeed there was one. When a sophisticated public figure telephones a high-profile columnist of the biggest newspaper in town before committing suicide in the lobby of the newspaper, the caller could not have had a “reasonable expectation of privacy in that communication.” In fact, Mr. Teele’s actions suggest he very much wanted to make a dramatic public statement. Notwithstanding Mr. DeFede’s professional role and legal obligations, he reacted the way one human being might respond to another in a moment of crisis. Though his judgment may have been flawed, his intentions were pure when he made the snap decision, in an emotional and terrifying instant, to record a call from a distraught man he says he regarded as personal friend. Mr. DeFede deserved to be cut some slack. Instead, he was hastily tried, convicted and executed by mangers who themselves were understandably unhinged by the horrifying event that had unfolded, literally, at their front door only hours earlier. If this was a single, aberrant incident, then the Herald’s managers owed it to Jim DeFede, and themselves, to consider a less drastic alternative than the corporate equivalent of capital punishment. There were many ways for Mr. DeFede to admit his error, accept his punishment and move on, leaving him to shoulder any personal legal consequences. The paper could have denounced his act, punished him with a suspension and put him on final warning not to do it again. This would have left the Herald reasonably in the clear from a legal point of view, while upholding its reputation as a law-abiding, fair minded and compassionate institution. So, what was behind the rush to summary judgment? Some say it was Mr. DeFede’s criticism of the management of the newspaper and its owner, Knight Ridder. “From inside the newspaper, Mr. DeFede became one of its most stinging critics,” reported the Washington Post. The conspiracy theory is too facile. Another possibility is that there is more to the story than meets the eye. Could Mr. DeFede have been warned in the past about improperly recording calls? We have no way of knowing and, to be absolutely clear, I am not suggesting this is the case. If those were the circumstances, however, then management would have had no choice but the one it took. If this was an isolated case of poor judgment by Mr. DeFede, then the simplest interpretation of events is that management acted impetuously, impaired in the heat of the moment by fear and misplaced, displaced anger. Was management worried about legal liability? As discussed above, the legal risk is arguable. Was management fearful of economic consequences in the form of criminal penalties or a civil damage suit and the legal costs associated with them? If I understand the statute correctly, the victim of an illegally recorded call can be awarded no more than $1,000 in compensation. Given that the victim is dead and that he and his estate suffered no evident damage as a result of the taping incident, the risk of a viable lawsuit seems limited. An amount equal or greater to the legal fees saved by rapidly firing Mr. DeFede probably will be expended to defend the Herald against any wrongful-termination lawsuit the columnist might be motivated to file. Was management worried about bad publicity? What could be worse than this? In its haste to jettison Mr. DeFede, the Herald has eroded significantly the bond of trust and loyalty with its employees that makes any business effective, be it a major metropolitan newspaper or a hamburger stand. Loss of confidence in the employer is particularly corrosive in the newsroom, where a cautious and cowed staff is antithetical to the conditions required to put out a compelling product that serves its community and remains economically vibrant. The management of the Herald didn’t do itself much good in dispatching Mr. DeFede with such dispatch. And it didn’t do right by him, either. With newspaper publishers fuming helplessly over predictions that online competitors could take a $4 billion bite out of their profitable want-ad revenues, Craig’s List has quietly increased its market share to a stunning degree across the country. The market share of total U.S. Internet visits to Craig’s List increased by 73% in the last year, according to new statistics released by Hitwise, an independent market research firm. The biggest advance was 2,345% in the San Francisco area, where the list was established in 1995 by Craig Newmark, an unassuming computer engineer who wanted to help his friends locate apartments or jobs. Today, the list will help you find everything from used moving boxes to true love. 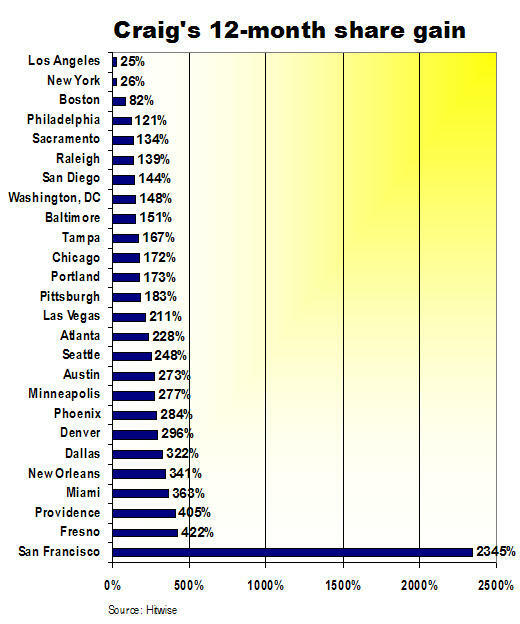 Craig’s share is up by more than 400% in Fresno and Providence, up by more than 300% in Dallas and New Orleans, and up by more than 200% in Atlanta, Austin, Denver, Las Vegas, Minneapolis, Phoenix and Seattle. More details in the table below, though you may need your reading glasses to navigate the fine print. Craig’s compendium of free online ads (he does charge for help-wanted ads in a few markets to pay his modest-size staff) cost Bay Area publishers some $50 million to $65 million in want-ad revenues as of the end of last year, according to knowledgeable estimates. 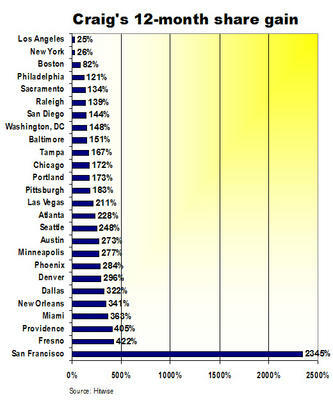 But the story in San Fran is nothing compared to what may lie in store for newspaper industry as a whole. Some 8.6% of newspaper revenues could vanish within two years as $4 billion in classified-ad revenues flow to eBay, Monster and free online sites like Craig’s List, according to McKinsey & Co. Although the loss of auto, real estate and employment ads would blow a major hole in the top line of the industry’s $46.6 billion in annual sales, the impact on the bottom line would be even more devastating. That’s because classified ads are, by far, the most lucrative segment of the business. The newspaper industry’s response to the threat has gone from denial to anger to dismay and, finally, angry denial of its dismay. Only the Tribune Co. has articulated a bold, if dubious, strategy to fight back by launching its own free-ad sites in 12 cities. Meantime, Craig and his business partner, eBay, continue to colonize not only this world but the galaxies beyond by beaming used-car ads into space. The only thing that might slow down Craig is the haggis he ate a few days ago in London. His blog features this picture of a sausage filled with an intimidating mix of oatmeal and unpsecified animal innards. Even if Craig is eating the lunch of newspaper publishers, it’s safe to assume they wouldn’t have wanted to eat his on that day. I have been around long enough that, unfortunately, I have been on both the giving and receiving end of pink slips. I am not sure which is worse, but I think giving them is. When you lose your job because management can’t find a more clever way to make its numbers, you are rightfully angry and afraid. Painful as it is to pack your career in a box and head off to an uncertain future, at least you know it wasn’t your fault. But the managers who did the deed have to come in the next day, and the next and the next, to face the empty desks that symbolize the lives they screwed up. If you are any kind of a human being, and most managers actually are, you blame yourself for not finding a better way to run the business than ruining the lives of innocent, hard-working people with mouths to feed and mortgages to pay. Sometimes, of course, it is the manager’s fault. In those cases, the managers, not their victims, ought to be the ones packing the boxes. More often, however, uncontrollable economic forces require a company to trim a division, scrap a product line or reduce headcount to negotiate a rough patch in hopes of navigating to better times in the future. Which brings us to the newsrooms of the New York Times Co., where some 190 jobs will be eliminated; the San Francisco Chronicle, where some 120 positions will be trimmed, and the Los Angeles Times, where an indeterminate number of pending budget cuts seem to have figured in the departure of editor John Carroll. Though the numbers may be smaller, the story is the same these days at many other newsrooms across the country. Although it is a tragedy when anyone loses her or his job, the cuts seem especially harsh when they happen in newsrooms, where journalists who are supposed to be minding the public’s business are, instead, worried sick about their personal circumstances. Having lived through such moments, including the folding of our beloved Chicago Daily News in 1978, it is hell, pure and simple. But the economics of the newspaper business these days leaves managers with little choice. With advertising weak, readership declining and costs climbing for everything from newsprint to gasoline to paperclips, the newsroom is one of the few places you can squeeze expenses to meet the profit targets of the (mostly public) corporations that publish our papers. Although it is no consolation to people losing their jobs, newsroom employment at the start of this year actually was slightly above the 25-year average of approximately 53,500 professionals, according to statistics complied by the superb State of the Media project. As you can see from the graph below, newsroom headcount historically has followed the ups and downs of the economy. Employment expanded briskly in the mid-1980s, peaking at nearly 57,000 in 1990. 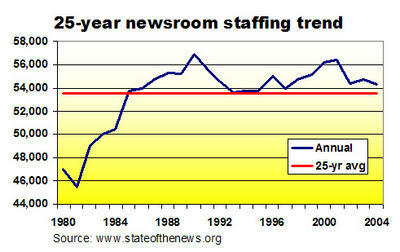 Staffing took a nosedive, along with just about everything else, when the Internet Bubble ran out of hot air. This year, however, headcount almost certainly will fall below the average for the first time since 1985. Why is this happening, with the economy doing reasonably well for a nation coping simultaneously with a war, a mega-deficit and record-high oil prices? Because newspapers (and the legacy broadcast media) are unable to maintain their historic share of advertising revenues, owing to increased competition from the new interactive media that enable marketers to achieve unprecedented efficiency and effectiveness in their campaigns. In but one example reported by Fortune magazine, Chrysler has put 18% of its $2 billion ad budget this year into online media vs. 10% in 2004. That’s $160 million fewer dollars for legacy media this year than last, or the equivalent of 7,200 reporters making $50,000 a year. Slow on the initial uptake, the traditional media companies finally are getting serious about earning their fair share of online revenues. But even briskly growing online sales can’t offset in most cases the secular market-share erosion affecting traditional print and broadcast advertising. With lower profits not an option for publicly traded companies, the legacy media have no choice but to nip expenses wherever they can. And newsrooms, unfortunately, are a good place to look, because columns and airtime can be filled with respectable material from the wires and other syndicates. The irony, of course, is that smaller, more overworked staffs are unlikely to produce the compelling local products required by the traditional media companies endeavoring to evolve into more plausible competitors in the new media mix. If the belt-tightening actually leads to a better day for the media companies, then the pain will have been worth it, except for those who lost their jobs along the way. Cutting jobs and other expenses without a realistic, long-term strategic plan to reposition these valuable businesses will lead over time to death by attrition. Businesses grow strong only by growing. No company can right-size its way to success. Average advertising sales gains for the newspaper industry were 2.8% in the first half of the year, but not all publishers are performing equally well. One even reported a slight dip in year-to-year revenues. That’s what you learn by reading the devilish details in the mid-year revenue flash from our friend Miles Groves of MG Strategic Research, the economist whose industry insights top the must-read list for senior newspaper execs. Comparing “same-store” sales of several publicly held newspaper properties, Miles found that Media General’s volume increased 6.5% this year over the first half of 2004. Gains of approximately 4% each were notched by Scripps, Gannett and Lee (the latter of which includes the integration into its P&L of the Pulitzer publications). Knight Ridder and Journal Communications were a touch under average performance, while the New York Times Co. and Tribune Co. managed to eke out respective, if not respectable, gains of only 1.3% and 1.2%. 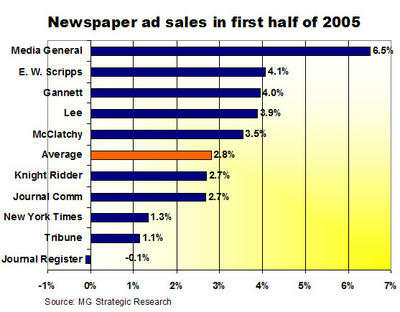 Bringing up the rear was Journal Register Co., which reported a reduction of 0.1% in year-to- year sales. Journal Register last year promised great things when it acquired a group of weeklies in suburban Philadelphia and a $415 million portfolio of dailies and weeklies in Michigan, although the impact of the Michigan properties will not be reflected until after the one-year anniversary of the transaction in the third quarter. First-half sales typically represent between 33% to 40% of a publisher’s annual revenues, with the major gains coming during the make-or-break Christmas season. It’s never over in the ad game until the fat man Ho-Ho-Ho’s. Q: What’s worse than getting scooped by a competing publication on a story you have been sitting on because you were afraid you might be get hauled into court to identify the source? A: Running the story a day late and getting hauled into court, anyway. That’s how things went down – and I do mean down – at the Cleveland Plain Dealer, whose editor gained an embarrassing 15 minutes of national fame when he admitted he wasn’t publishing “two stories of profound importance” because his company, Advance Publications, didn’t want to go to the trouble and expense of protecting reporters who might be compelled by a court to reveal their confidential sources. This all comes at a time, of course, when Judith Miller of the New York Times is serving a contempt sentence in a federal prison for refusing to name the sources she interviewed for a story she never wrote about a crime that evidently wasn’t committed. The Plain’s Dealer’s determination to sit on its too-hot-to-handle stories crumbled rapidly after the Cleveland Scene, a scrappy alternative weekly, published the details of one of the stories gathering dust at the rival P-D. The story actually is profoundly important, too. As reported first by Cleveland Scene and confirmed a day later by the newly emboldened P-D, a 2002 FBI affidavit sealed by a judge asserts that there is "probable cause" that former Cleveland Mayor Mike White was on the take. "Once another medium identified us as a holder of the documents in question, holding back the story became moot," said P-D editor Doug Clifton, explaining his abrupt reversal. "We think that it was a public service to be done in reporting the contents of the affidavit," he added in what could be construed as a compliment to the Scene. Once the stories were published, Doug and the editors of the Scene were summoned before a federal judge who demanded to know who leaked the sealed affidavits on which the articles were based. When the editors refused, the U.S. attorney said he would check with his bosses in Washington to see who should prosecute the matter. "We'll go to jail if we have to," said Doug. If he had said that three or four weeks ago, he would have been a hero. Now, he looks like something else. The folks who tattoo bar codes on pears see a future for laser-imprinted advertising on the sides of bananas and kumquats, too. This is the most innovative concept I have seen since the first time I saw an ad plastered above a urinal in an otherwise-forgettable Applebee’s in Aiken, SC. If food catches on as an advertising venue, it is only a matter of time until Pfizer slaps an invisible Lipitor ad on the side of steak, so it magically sizzles into view when you grill it. When they do, make my "medium" rare. 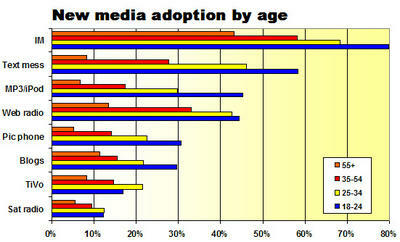 The newer the media, the younger the users. They younger the users, the faster they adopt a new medium. These rules of thumb apply when gauging the impact of such thumb-intensive new media as text messaging. Joe may not know exactly how to sell stuff to the nomads, either. But at least he knows where to look for them, thanks to an online poll he conducted for BIGresearch, an independent market-analysis company. In the poll, Joe found that 79.8% of respondents between the ages of 18 and 24 “regularly or occasionally” use instant messaging, 58.3% use text messaging, 45.3% use iPods or similar portable audio devices, 30.6% use picture phones and 29.6% read blogs. Full details of Joe's findings are in the table below, but remember that this was a self-administered online poll, which, by definition, is biased in favor of the technically intrepid and doesn’t reflect the behavior of any of the remaining Luddites lurking out there. Accordingly, marketers and media companies lusting for young consumers need to learn how to successfully blend new-media tactics with their conventional print and broadcast initiatives. Research shows that young people are avid media multi-taskers. That is, they are likely to be simultaneously chatting on IM, listening to a CD and yakking on their cell phones while the TV blares in the background and they are “reading” a book for school. So, it isn’t hard to reach them by one means or another. The hard part will be getting them to pay heed, given their increasingly abbreviated attention spans. While none of the above is shockingly new, I was astonished to learn that 43.1% of people aged 55 or older use instant messaging and that I was not among them. Frantically concerned that I was being left behind, I consulted one of my youthful friends, who is a mere 52. He advised me that the coolest thing nowadays is Skype (rhymes with “hype”), which combines free IM with free international phone service to 131 million-plus users. In one quick download, I vaulted from near-obsolescence back to the bleeding edge. So, now you can skype me at admutter. The service works great. The only question is whether the proper spelling for the present tense of the verb is skypeing, skyping or skypping. Scared silly by the case that landed Judith Miller in jail for not identifying the people she interviewed for a story she never wrote about a crime that evidently wasn’t committed, editors have declared open season on confidential sources. Issuing urgent directives on the proper handling of confidential informants, Gannett and the Los Angeles Times in the last few days have promulgated convoluted policies guaranteed to frighten and befuddle not only potential sources but also the journalists -- and the readers -- who depend on them. At Gannett, Phil Currie, the senior vice president for news, instructed staffers via an internal website to be sure to let potential sources know exactly how confidential their identities will be. Or not. "This does not mean each option must be discussed with the source, but each party should understand the agreement,” said Currie, as quoted by Editor and Publisher, which has been doing a superb job of chronicling the government’s depressing effort to suppress the press. Among the options available to potential confidential sources of Gannett newspapers, said Phil, are: “(a) the newspaper will not name them in the article; (b) the newspaper will not name them unless a court compels the newspaper to do so; (c) the newspaper will not name them under any circumstances. Some circumstances, he added, “do not merit going to 'level c,' and everyone should be clear on that." In other words, Phil appears to be saying that confidential informants can be confident their identities either (a) will or (b) won’t be protected. Got that? What, then, is the L.A. Times policy on confidential sources? Is a reporter allowed to promise confidentiality to a source, so long as it isn’t written down? If no written record exists, will the newspaper defend a reporter against legal efforts to compel him to reveal his source? If the promise isn’t documented, can’t the newspaper deny it ever existed? Will a reporter be forced to hock her pension to hire lawyers to defend her right to protect her sources? Or, should she just go directly to jail? The policies articulated by Gannett and LAT are polar opposites. If Gannett wants all the I’s dotted and T’s crossed, this would suggest that publishers, editors, reporters and prospective informants need to execute some sort of pre-interview agreement before the sources are debriefed. The LAT, on the other hand, doesn’t want anything in writing, so there apparently would be no documented arangement, much less the details of the terms enforcing it. Either way, what’s a poor reporter to do? Checking newsrooms from Baltimore to Detroit to San Diego, E&P’s Joe Strupp found most editors favor the adoption of something like the L.A. Times’ idea of not putting things in writing. So far as can be determined, none of the newspapers has prohibited outright the use of information from confidential sources, but these posterior-protecting policies for all practical purposes will do just that. Beyond frightening the bejabbers out of every reporter and editor who wants to do the right thing by his employer, the public and his source, these vague and troubling policies would spook any sensible person planning to drop dime on a big story. Until now, confidential sources have been assured by reputable news organizations that their identities would be protected at all costs – including legal fees, fines and jail for reporters held in contempt of court for not giving up their sources. Everything changed last week when Time Inc. broke ranks with the New York Times and chose the path of weaseldom by releasing internal files identifying the confidential sources sought by the federal grand jury investigating the outing of Valerie Plame, the former covert CIA operative. Ironically, one of the sources identified by Time is Karl Rove, the leader of the White House political braintrust. The source on this is Newsweek, which scooped the rival Time on the contents of its own internal files. You can’t blame publishers and editors for worrying, like the Cleveland Plain Dealer, about being hauled into court and forced to identify their confidential sources. As Time and the NYT can attest, it is an expensive and emotional distraction fraught with ongoing political, commercial and legal risk. To minimize the potential exposure to such unwelcome events, newspapers shouldn’t muzzle reporters or jettison confidential sources. Rather, they must develop clear and thoughtful controls over when to grant confidentiality, who deserves it, and whether, if ever, confidentially can be abandoned. The hasty guidelines articulated to date are so timid and vague that they only can chill future reporting. With wise policies in place, along with a decisive commitment to defend the vital practice of using confidential sources, the press can move forward confidently once again to deliver the significant and compelling stories that only such sources can help produce. It’s a right and a cause worth defending. And it’s why Judith Miller is sitting in jail. Google and a few of its friends have decided to short-circuit the middlemen and plug directly into your electric company to sell a full range of broadband services, including potentiallly limitless video on demand. While cable and telephone companies long have scrambled with varying degrees of success to become full-service, triple-play providers of video, Internet and voice services, the third line into every home, the power line, has been quietly buzzing along and largely overlooked. Not any more. Google, Hearst Corp. and Goldman Sachs have put $100 million into a private company called Current Communications Group, which says it can send and receive high-speed Internet signals to homes and businesses via the existing electric grid. The tres unlikely amigos are teaming up at Current Comm with earlier investor John Malone, the man who built Tele-Communications Inc. into a cable TV behemoth before he sold it to AT&T at the peak of ripeness in 1999. Several small broadband power line (BPL) start-ups have spent a long time trying, without much technical or commercial success, to safely coax satisfactory Internet-protocol signals through electric lines. The plan was to provide an electrifying alternative to the enviable businesses of the high-priced cable guys and the low-tech telephone companies. To date, various flavors of BPL have moved out of the lab and onto a few hundred utility poles in a small number of experiments. But the evident success of a 50,000-home pilot in Cincinnati has turned Current Comm into Google’s preferred partner in what appears to be no less an effort than delivering unlimited video on demand (VOD) to any home, shop or office with access to electricity. The Current Comm deal dovetails nicely with the recent "beta" launch of Google’s Video Upload Program, whose stated mission is to give the world “a growing archive of televised content -- everything from sports events to dinosaur documentaries to news programs.” In addition to televised content, Google will “host video from anyone who wants to upload content to us.” Participants can offer their video free, or sell it by splitting revenues with Google. Combining its search acumen, a vast video library and ubiquitous delivery through BPL, Google has a shot at delivering the Holy Grail, virtually limitless VOD. The achievement would outflank the long-promised efforts of the legacy multi-channel TV and phone companies, which continue to battle technical restrictions, the limitations of their business models and, not least, each other. The cable companies that invented the multi-channel TV market have done an excellent job in metro areas of upgrading 1970s-era technology to provide 21st Century broadband services. Consumers today prefer cable modems by 1.5 to 1 over the slower DSL services sold by telephone companies. Capitalizing on their success in multi-channel TV and broadband, cable companies now are starting to offer voice-over-IP (VOIP) technology to provide what is known in the industry as “triple play” services. To deliver video on demand with the depth and variety envisioned by Google, however, cable companies would need the enormous inventory, search capability, agile delivery system and billing capabilities that Google appears to be aiming to create with Current Comm. Unfortunately, the existing VOD systems used by cable and satellite providers are limited to a handful of offerings by, among other things, constrained content libraries, finite server capacity, restricted satellite availability and rigid billing systems. With Google doing its own thing with Current Comm, the video companies will have to scramble for partners (Yahoo? Microsoft?) to cobble together the capabilities they lack. As a successful first mover in providing wide-scale, unlimited VOD, Google may be able to lock up valuable contracts for vital content in Hollywood, Bollywood and beyond. That alone would give the competition an Excedrin headache. Telephone companies are in even worse shape than cable for competing in the VOD space. Slow on the uptake when the Internet arrived, the telcos have gotten better over the years at providing DSL services to ever-growing audiences at favorable prices. But their legacy business, Plain Old Telephone Service, is being eroded by mobile phones and VOIP, which in recent quarters have taken bites of 4% to 6% out of the POTS subscriber base. Hoping to become full-fledged, triple-play players, the Baby Bells have vowed to replace their ancient, twisted-pair copper plant with fiber-rich systems like those deployed by modern cable operators. In the meantime, they gamely are trying to head off cable’s hegemony by marketing satellite services like Dish, which are even less capable than cable of delivering unlimited VOD. Even if the phone companies built their “Field of Dreams” networks and the subscribers came on cue, they likely would have the same problems as the cable companies in provisioning true, unlimited VOD. None of this is to say Google is guaranteed a smooth ride to success with Current Comm. GOOG still has to build the video library, as well as perfect the systems required to index and serve inestimable volumes of varied content. Further, major questions will remain about BPL until the technology reliably serves many thousands more subscribers than it does today. If all the moving parts come together successfully, however, Google could be worth as much as its bubblicious stock says it is. Heck, maybe even more. Only hindsight will reveal how close we are today to the moment that mass-media advertising morphed from being the quintessential marketing tactic to being a quaint, faint anachronism. But the day is coming -- and it may be closer than you think. Only institutional inertia -- the fear of change and, significantly, the fear of making the wrong change -- has kept advertising revenues as stable as they have been to date. Shrinking ad budgets, dissatisfaction with the expense and accountability of traditional mass media, and rising confidence in the interactive media are steering marketers away from the assumptions and conventions that historically have governed their behavior. Generations of marketers resigned themselves to the inherent inefficiency of one-size-fits-all advertising best described by John Wanamaker in 1886, when he said "I know 50% of my advertising is wasted but I don't know which half." One hundred years later, the Internet and other interactive media have made the answer, and the alternatives, abundantly clear. Sophisticated marketers now know they have to allocate ever-larger portions of their budgets to media that can be targeted, efficiently purchased and measured. The issues for them are not whether to do so but where, when and how much. As their confidence and competenece grows, the velocity of change will accelerate. Half of senior marketing executives already plan to spend less on newspaper advertising this year than they did a year ago, according to a new survey by the Association of National Advertisers, a trade group representing 8,000 companies buying $100 billion a year in marketing communications. The poll found more than a fifth of the advertisers planned to put some of their print dollars into other media. 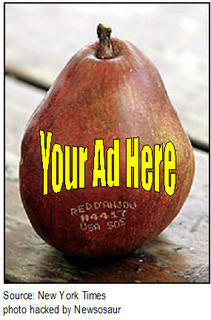 Significantly, three-quarters of the marketers will shift their former print dollars to online. Television advertisers are alarmed by declining viewership, as well as Accenture's projections that 40% of U.S. households will own digital video recorders within four years and that nearly three-quarters of DVR users zap most commercials into oblivion. iPods and other mobile media threaten the radio business by giving consumers extreme personal choice, including the ability to program endless hours of customized, commercial-free fare. 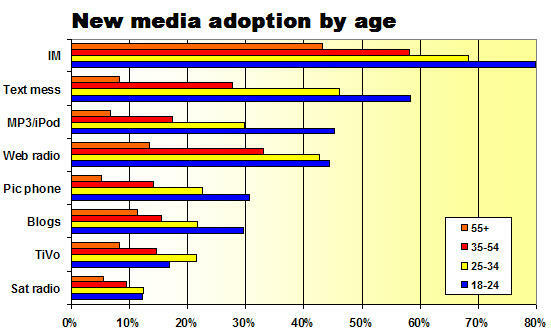 Marketers also know the mass media are a mismatch when it comes to reaching younger consumers. As discussed here previously, young people, who on average spend more than 8.5 hours a day on media, devote a piddling 43 minutes to print. Although they love music, tech-savvy young people are increasingly likely to pick and choose among MP3s and podcasts, instead of listening to the radio. Although they spend appalling amounts of time watching TV, a growing number of young people take control of the experience by clicking past commercials on multi-channel TV, renting DVDs or even making their own movies. Until approximately 10 years ago, newspapers, television and radio were not merely the best thing available to advertisers, but, practically speaking, the only thing. Not any more. 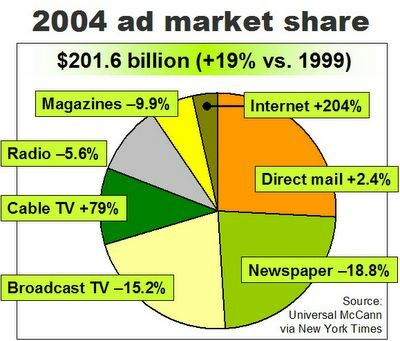 In the five years ending in 2004, the market share of the three principal mass media (illustrated below) fell at the same time that total U.S. advertising spending rose 19% to $201.6 billion. Newspaper share is down 18.8%, broadcast TV is off 15.2% and radio is down 5.6%, according to Universal McCann, the ad agency. The shares of the targetable media, by contrast, have grown by 2.4% for direct mail, 79% for cable TV and 204% for the Internet. Markets, as J.P. Morgan wryly observed, tend to fluctuate and the advertising market is no exception. It is possible, therefore, that the data in any comparatively short period are affected by fad, fancy or atypical economic forces. But I believe we are at or near a point of profound market disruption, which is not being adequately detected by the analysts who continue to package such prosaic projections as future want-ad demand and the seasonal pricing of prime-time spots. The cascading confluence of events suggests the mass media model is riding a roller-coaster that is headed inexorably down. And the G-forces are accelerating.